An exciting debut thriller about global finance and arms trading written by a private investigator with decades of international experience. From San Francisco to London to Kiev, Graham Gage is in a race against the FBI and Ukraine gangsters to solve an intricate stock swindle and arms deal in time to clear his friend. Gage peels away the layers of the collapse of SatTek in San Jose to find a plot that morphs into something bigger. Weaving a carefully layered tale of greed, money laundering, and European politics, and creating a great cast of characters, Gore delivers a thrilling first book in a promising new series. 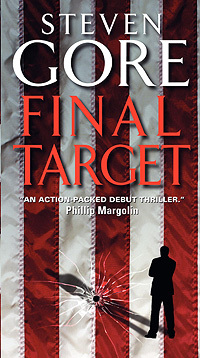 "Steven Gore's Final Target is an action packed debut thriller with a unique plot and vivid characters . . . fascinating." "Steven Gore bursts onto the international thriller scene with a captivating debut. From the boardrooms of the Bay Area to the international financial centers in London to outposts in Kiev. Lightning paced, deftly plotted, and compulsively readable."